Have you ever imagine robots in a farm? 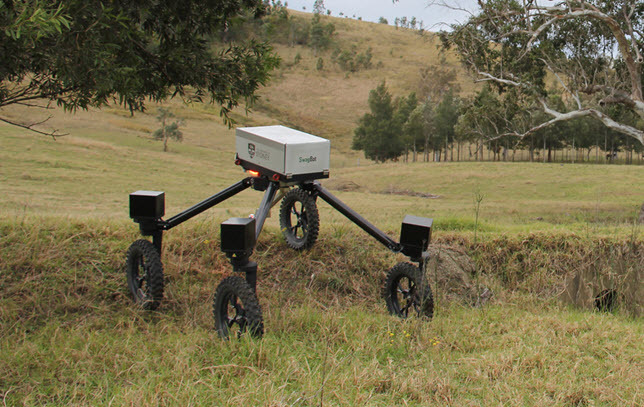 Probably not, but that could change in time thanks to SwagBot, the University of Sydney's autonomous, cattle- herding robot prototype.Even though the name sounds like it was given by a hipster millenial type of person, SwagBot could instead be an invaluable ally for farmers. It is omnidirectional, it can easily navigate through bumpy terrain. Moreover, it can tow trailers around the farm. Traditionally, farmers used animals such as dogs to herd the cows, but imagine the possibilities of robot farmers, SwagBot's team plans to enhance its feature with sensors that allow the robot to monitor the condition of cows in the field on a regular basis. It will be able to determine if the cow is sick or injured.Want to know more about this awesome device? Follow this link!